Located in Disney, Grand Outdoor Living specializes in high-end outdoor and patio furniture from leading names in the industry, as well as exceptional service, customer care. No longer just a place for grills and lounge chairs, patios, decks and backyards have become spaces for outdoor living and no place embraces this growing trend more grandly than Grand Outdoor Living. Located in Disney, just minutes from the historic Pensacola Dam and Grand Lake O’ the Cherokees, Grand Outdoor Living specializes in high-end outdoor and patio furniture. Whether you’re looking for a table and chairs for dining al fresco or want to create an outdoor living space that is an extension of your home’s interior, Grand Outdoor Living has everything you’ll need to enhance your open-air space. O.W. Lee — For more than 65 years, O.W. Lee has designed and produced fine, handcrafted casual furniture. Its artisans combine centuries-old techniques with state-of-the-art equipment to produce beautiful casual furniture. Retana — A commitment to excellence, dedication to design integrity, qualify craftsmanship and attention to detail has firmly established Ratana as one of the most respected and trusted brands in the industry. Ranging from traditional to contemporary, its pieces cater to any style and setting to enhance luxury lifestyle living. 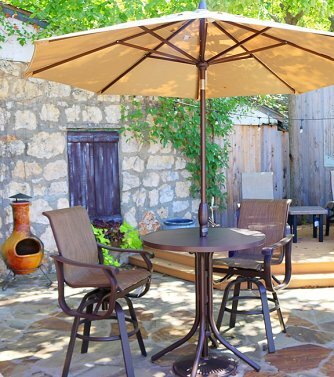 Telescope Casual — A family-owned and -operated business focusing on comfort, style and quality, Telescope Casual has been producing quality, outdoor patio furniture in the USA since 1903. Its high-quality product line includes wicker, aluminum, cast aluminum and resin furniture. Treasure Garden — Since 1984, Treasure Garden has been producing top-quality, custom-made, handcrafted umbrellas. The company provides the larges and most innovative selection of shade solutions to suit all your needs, including umbrella lighting and furniture cover protection. Corinthian Bells — Combining excellence in design with incredible tones and resonance, Corinthian Bells wind chimes are both visually and acoustically exceptional chimes. Made in Virginia, the line of wind chimes is noted for quality, superior materials, attention to detail and superb craftsmanship. The store is also a dealer for Hasty-Bake charcoal grills. A Tulsa tradition since 1948, Hasty-Bake charcoal grills have long been considered the best backyard charcoal grills in the industry. Grand Outdoor Living also carries a wide array of Hasty-Bake accessories, including hardwood charcoal, fire starter, covers, aprons, spices and seasonings. The store can also order parts for Hasty-Bake charcoal grills. Each of the brands you’ll find at Grand Outdoor Living are known for their style, comfort and durability and represent owner Mike Hopper’s commitment to offering only top-quality products. Before introducing a new product at his store, Mike researches each furniture and accessory line to insure it meets the highest quality standards and will stand up to the test of time. These brands, such as Corinthian Bells wind chimes, are the same he chose for his own home. In the case of the wind chimes, he says it was easy to decide to carry them at Grand Outdoor Living because he’s had his Corinthian Bells wind chimes for more than 5 years and they are virtually indestructible. The collection of outdoor and patio furniture on display at Grand Outdoor Living are just a sampling of the many styles and varieties available. For an outdoor space designed just for you and your family, Grand Outdoor Living offers custom ordering, which lets you pick and choose exactly what pieces, styles, fabrics and colors you want for your outdoor space. The high-quality available at Grand Outdoor Living extends beyond the name brand outdoor and patio furniture. You’ll also find exceptional service and customer care. Don’t just sit inside wishing you were relaxing outside. It’s time to take full advantage of lake living and move the fun outside. And, you don’t have to leave Grand Lake to find exactly what you’re looking for. From lounging and entertaining to dining alfresco or making memories around a fire pit, Grand Outdoor Living can help you achieve the outdoor living space of your dreams. If you’re looking for outdoor furniture to spruce up the exterior of your business, Grand Outdoor Living offers fabulous custom plans for commercial businesses. During lake season, Grand Outdoor Living is open from noon to 5 p.m. Fridays and from 19 a.m. to 5 p.m. Saturdays or by appointment. After Labor Day, the store is open by appointment only. Call for an appointment. They can usually meet you at the store within minutes.